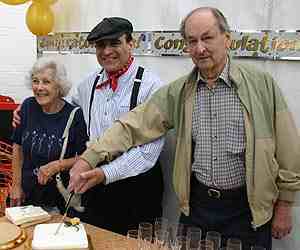 Just a few pictures from Raymond’s Golden Jubilee celebrations on 28th June 2008. Tim Coghlan (now Patron of The Friends of Raymond) introduces David Suchet just before David unveils a plaque to the Collin’s family. 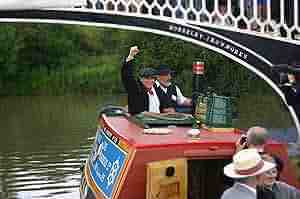 They crewed Stanton which accompanied Raymond on the last Jam ‘Ole Run. 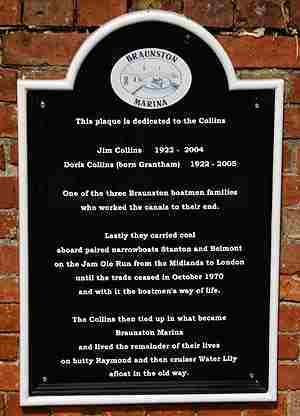 The plaque to the Collins’s. 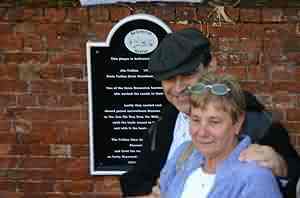 David and Joan Walker (Doris Collins’s niece) after the unveiling. Tim made a very welcome donation to the Friends of Raymond. 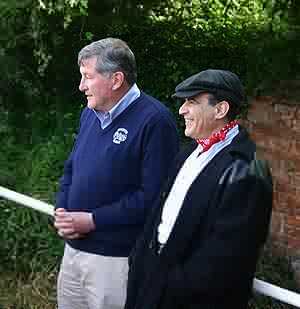 David Suchet, aboard Raymond, declares the Show open. David, flanked by Aubery Berriman and his wife, cut the Birthday cake. Aubery was the foreman builder who constructed Raymond back in 1958. 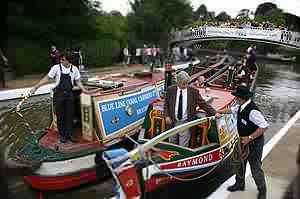 After the customary parade of working boats, Nutfield brings Raymond to moor at the exact spot where she was launched 50 years ago.